Harmony in the household is such a joyful thing! I’ll be honest. Behind every DIY recipe and concoction that I share, there’s a multi-tasking master (me) that is leaving disorder in her wake. Harmony does not always live at our house. The night before last, I was snuggled up on the bed all warm and cozy, and suddenly there is a loud bang, crash and the sound of gushing water. After searching the house, I walked into the pantry my feet slipped and slid in sticky liquid. I started giggling uncontrollably. My most recent experiment with Carrot wine had gone awry by becoming carbonated. Coincidentally, this wine explosion happened right at the time that my husband and I had a bit of a verbal explosion about the disharmony in our house. Our home is a busy, multipurpose space. It’s a commercial kitchen, a home business and so much more. We spend a lot of our time working outside, and the laundry always piles up before I get to it. I struggle to maintain order in the house, and it bothers me. I was thinking about all of this and feeling overwhelmed when a friend mentioned that she’s been going through her home and re-organizing using the KonMarie organization method. She was quite convincing when she described how wonderful it has been for her, so I decided to give it a try. The KonMarie method is about decluttering your life while also learning to value and treat your possessions with care. Each family member has a responsibility for their items, and as such, this creates a common goal and harmony in the house. The bottom line is that It’s about choosing joy. In this age where there is so much pressure to spend, consume and create debt – gratitude and care towards what we own sends a vital message. We would be a lot happier if we stopped spending money on stuff we don’t need. I gained something meaningful from this exercise, picked up some new skills and even if at first glance this method seems too fashionable for an old fashioned homestead – it merits a more in-depth look. The Order that you tackle this project is clothing, books, papers, Komono (miscellaneous items), Mementos (items with sentimental value). Clothing is the first step. 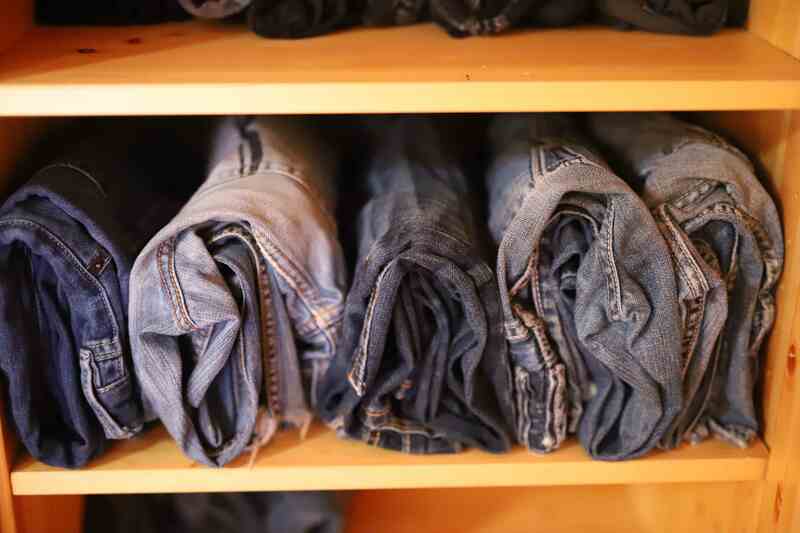 You gather up all of your clothing – every item and pile it on the bed. I’ll admit, I demonstrated a bit of snobbery when I first embarked on this task, and I am eating a few slices of humble pie as I type this. When I watched the television show and saw the huge piles of clothes on the bed, I was quite judgemental. We are careful about how we spend money and don’t buy clothes all that often. As a mountain of clothes piled up on the bed, and then ended up in the reject pile, I was quite shocked. Yes, we might be mindful shoppers, but we also hang onto things for far too long. Some items of clothing were 20+ years old and had not been worn in a very long time. You are supposed to work on your clothing pile by yourself. We broke the rules and worked together. I began by piling all of my husband’s clothing onto the bed, digging every single item out of drawers, boxes, and hangers. Then we went through it piece by piece, sometimes modeling it, sometimes reminiscing about the memories the items awoke, and we were having fun, laughing as we sorted clothes together. In 20 years, this is the first time we have EVER done something like this together. 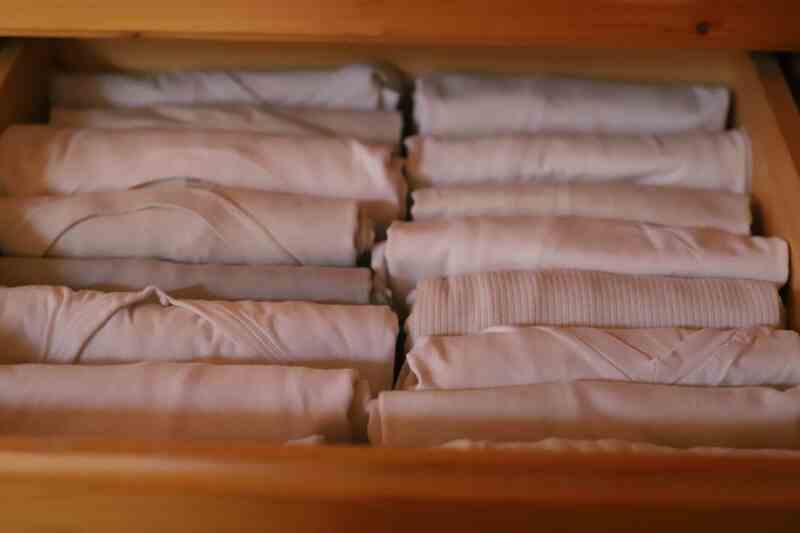 As my husband made decisions, I worked on folding and organizing. 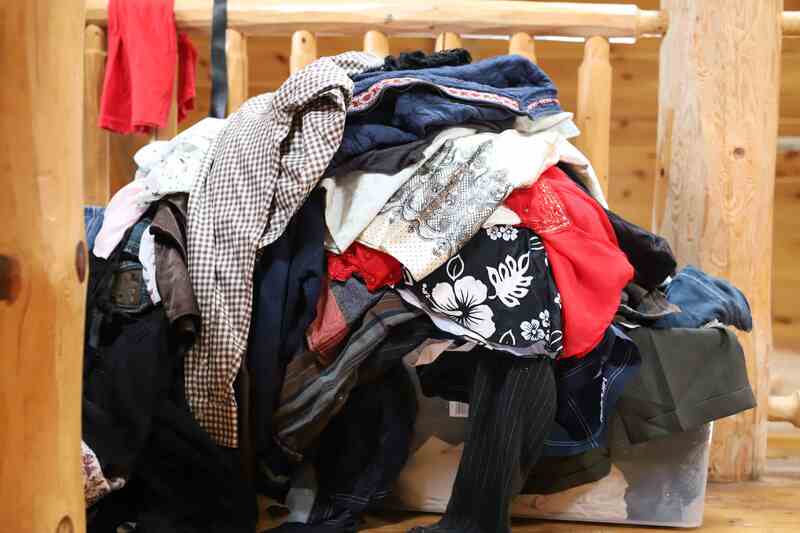 Once we finished his pile, we started with my clothing, repeating the process over again. The Kon Marie Methods are impactful. I tried going into this with an open mind, but admittedly there was a touch of skepticism when I started. I am not one to follow trends and discovering this on Netflix screamed “flavor of the month.” The book along with my friends’ enthusiasm convinced me to give it a try. After doing so for over a month, I can honestly say it is straightforward to maintain once you get things set up. I appreciate my possessions more, even my beloved yet very ratty jeans and t-shirts look nice folded up with care. I can find everything more efficiently. My husband doesn’t need to ask me where things are kept as he was part of the sorting process and knows as well as I do. We both feel a sense of joy when we open a drawer, and everything is in its place. Organizing all of the big homestead items that we require was a challenge. These items don’t exactly bring us “joy,” but they do empower us and we need them. 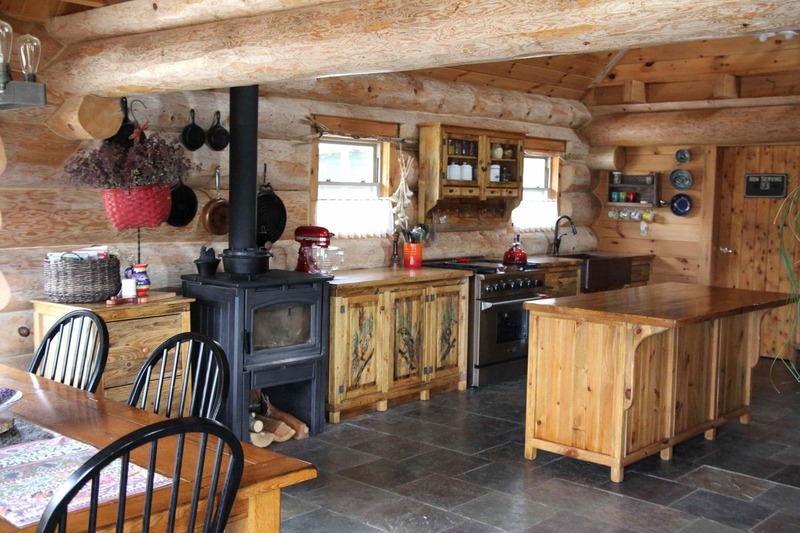 Let’s face it; most kitchens are not designed to hold all of the things a lot of homesteads rely on for canning, preserving and storing large amounts of food, this adds a layer of complexity. We’ve extended our kitchen storage to the garage. We built dedicated shelving to house all of the large oversized items that the kitchen struggled to contain. Huge pots, canners, dehydrators, carboys, excess canning jars, now live in the garage. If you do this, be sure to remove any gaskets, gauges if you live in a cold climate. I can’t get past the fact that there is no “away” when it comes to consumerism. Tossing your excess into bags and donating or throwing out dozens of bags of items is not exactly making the world a better place. Just because it’s no longer your problem and it is now someone else does not make it right. A lot of clothing that gets donated still ends up in the landfill because there is TOO MUCH of it. We take responsibility for the items we have accumulated over the years. Instead of discarding, we’ve kept the clothes and paper so that we can re-purpose it. Sure, this means we have a few several boxes of things stored for now, but it feels like the right thing to do. We won’t benefit from the instant gratification of getting rid of all clutter immediately, but in the long run, we will be better off for having done this. 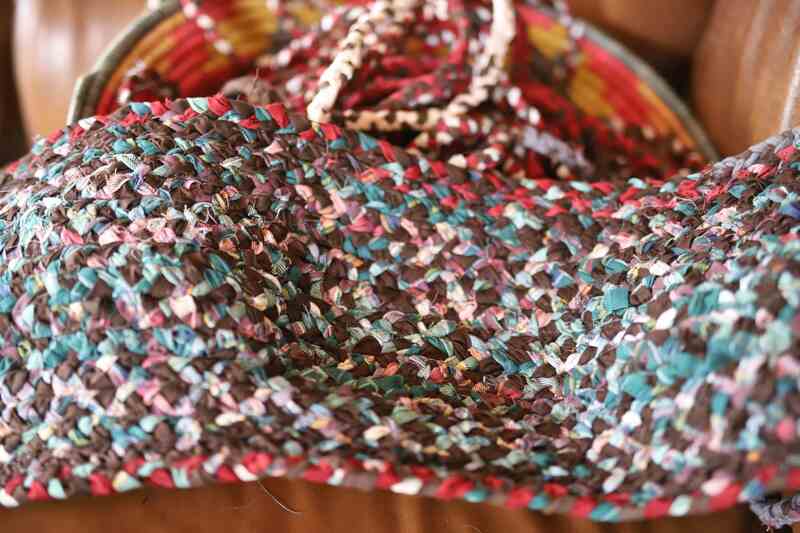 We’ve started a rag rug which has become a family project, sure to be a treasured heirloom. The clothing used to make this rug served us well, and will continue to do so for a long time. 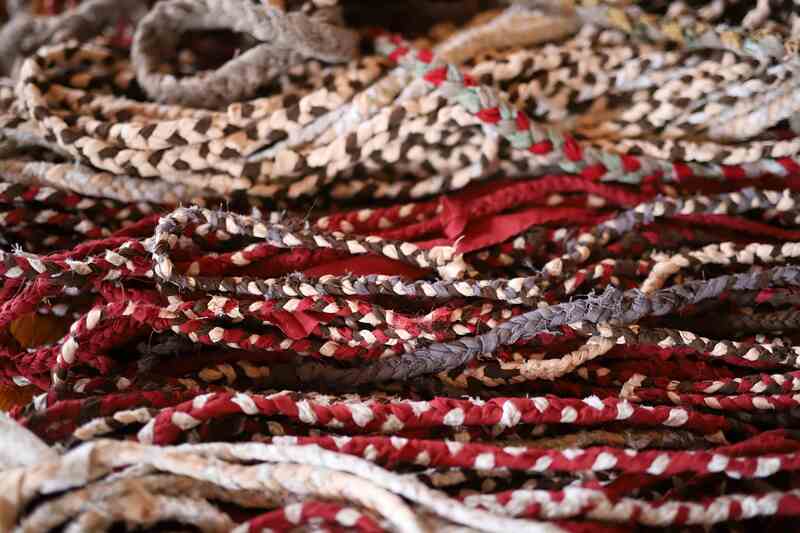 Our grandmothers sat and made rugs much like the one we are making. It feels good to be learning a new skill. We intend to make some pillow covers, some new dog toys, and all sorts of things with the fabric. We’ve set aside a bucket filled with paper. We will transform this into hand made, artisan paper when we have time. We have almost completed all of the stages of sorting, and there is more harmony in the house. It is much easier to keep our home tidy with everything having a designated spot. I am glad that I read Marie Kodo’s book: The Life-Changing Magic of Tidying Up: The Japanese Art of Decluttering and Organizing and watched a few episodes of the series playing on Netflix. Marie Kondo has charmed me. What do you think? Have you tried the KonMarie method? Thank you for this post, Charlotte. It’s wary timely. We to have been pondering about how to get more organized in our homestead. 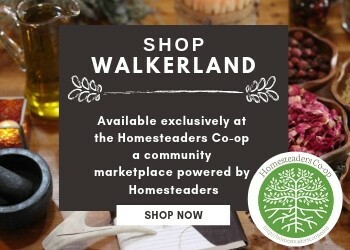 There is lots of help everywhere on how to organize a home (clothing, deco etc), but a homestead shop and basement are a different story. 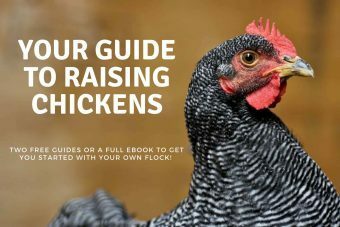 Wondering how helpful you and your man found the book for homesteading things? Love your rug idea, this one is worth sharing. You are an inspiration! Hi Anna. the process and the underlying philosophy that she teaches is truly valuable. I didn’t get into the emotional side of it too much but I think everyone could benefit from this practice. It is very enlightening. My perspective on possessions and hanging onto things that no longer have a purpose has changed completely. There are some good lessons that are very much relevant to a homestead. It feels really good and I am still happy we’ve gone through her process.